Main idea is a big deal. It is the essential message of a text or other communication. 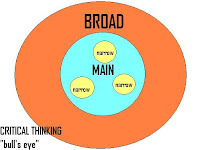 We talk about the main idea whenever we are trying to distill our complex information needs into simple key terms (keywords) that another person or computer will understand. Throughout the school year we have been carefully selecting keywords that are connected to our search needs. Keywords are a central part of the lessons on library catalog use, subscription databases, and search engines. Main idea is a central part of how we share great reads with one another, something students are encouraged to do on a regular basis. Don't get me wrong... building on previous knowledge is a fantastic, amazing, beautiful thing. However, when engaged in the information gathering stage of research it is imperative to focus on what the text is saying, not what we think it should be saying. Our personal biases can lead us down paths of confirming what we already believe, all the while missing new ideas, which are the reason for research. Keyword Practice Sheet: The template I have been using to help students focus on the main ideas and information presented in the source text. Brain POP Main Idea Information and Activities (also BrainPop Jr.): Includes several activities for use with both individuals and groups. SMART Exchange Main Idea Search: Produces a result of approximately 715 activities. Limit this search by grade level or subject area to find SMART notebook lessons that will work well in your classroom. Promethean Planet Main Idea Search: Produces a result of approximately 60 activities. Limit this search by grade level or subject area to find flipcharts or other resources that will work well in your classroom. 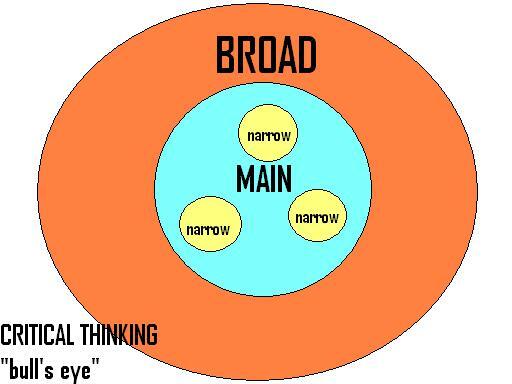 Main, Broad, Narrow Ideas: The blog post where I found the visual aid at the top of this post. Ms. Bannon: Full Lesson on Finding the Main Idea: Teaching Channel video, third grade teacher demonstrates a lesson to help students identify the main idea. Includes transcript, lesson plan, and teacher's favorite reads. The video shown below* demonstrates an activity that could easily be adapted to an interactive board lesson.